Thea Jane Van Gorp is a reporter for the Arizona Daily Wildcat. She wrote an article previewing the Bennuval! event, which was held in Tucson, AZ on September 12, 2015. She provided this review of the evening from her unique perspective. Bennuval! 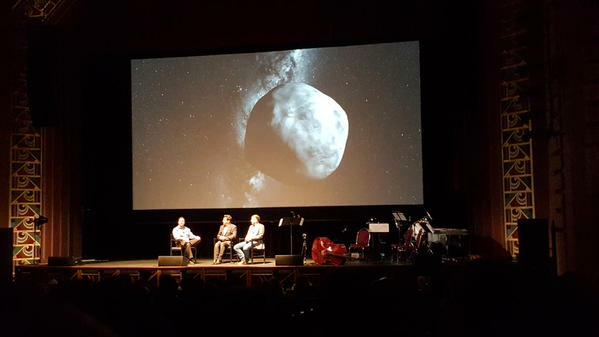 An evening of Space, Art, and Music was born Saturday, September 12, 2015 at the Fox Theatre. Not only was it a celebration of the OSIRIS-REx mission, but also a celebration of the wonderful universe in which we live where science and art are one in the same. Dante Lauretta, leader of OSIRIS-Rex mission and a Professor here at the University of Arizona, created a show that not only embodied the artistic natures of science but the creativity and talent Tucson is host to. 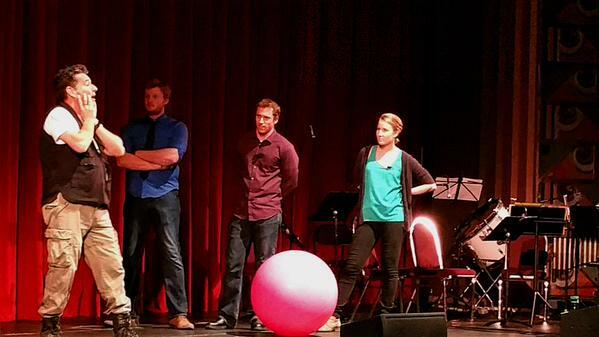 Ranging from meteorites to improv comedy, Bennuval! 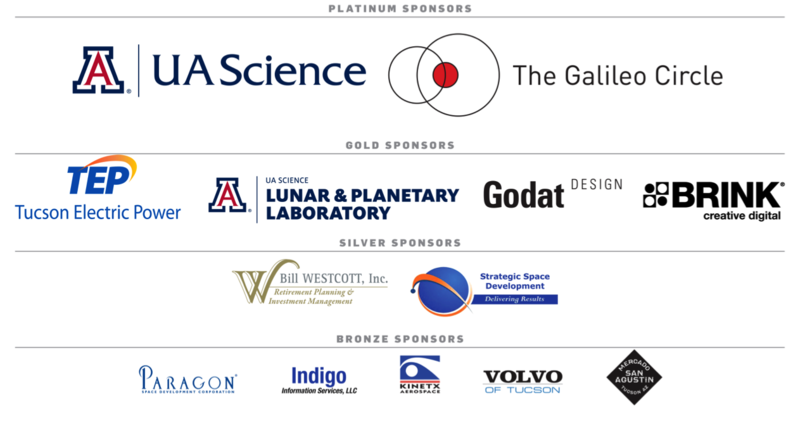 encompassed scientific creativity and the potential Tucson has. Bennuval! 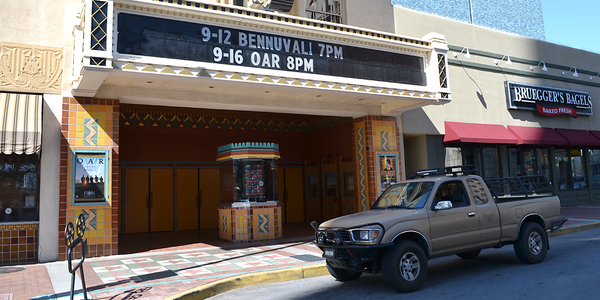 was held at the Fox Tucson Theatre – the Jewel of Downtown Tucson. The event started with a gallery in the lobby and downstairs floor of incredible artwork created by Tucson locals and more. Paintings of space and abstract representations of our journey to it lined the walls. The arts community was very present and actively reaching out to the public. It was wonderful to see so many successful artists under one roof sharing their creations. The Art of Planetary Science provided an art exhibit that blended art and science. 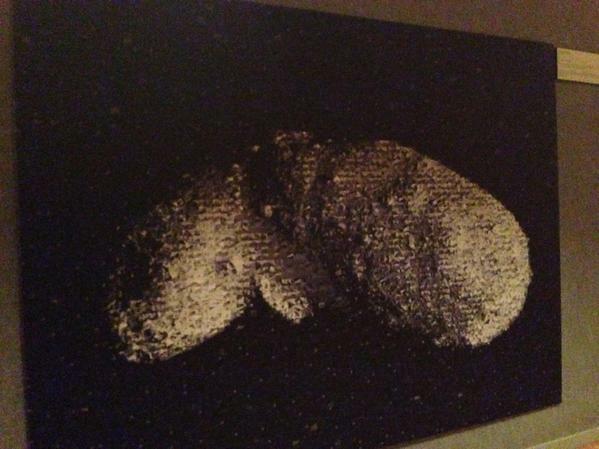 This image of asteroid Itokawa is composed of electron microscope images of grains from the asteroid surface. 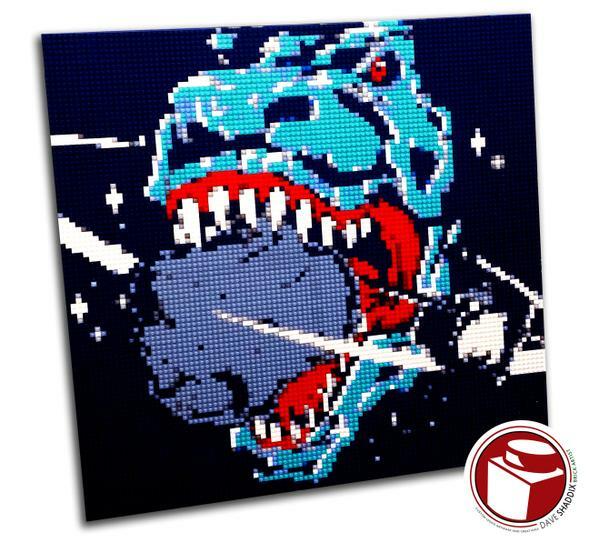 Lego artist Dave Shaddix provided a Lego rendition of the OSIRIS-REx dinosaur logo. To commence the first ever celebration of art and science, Geoff Notkin, from Meteorite Men, introduced the audience to the main idea behind this event. He explained his passion for both the arts and sciences and how they should be seen together, celebrated together. Because without one, there certainly wouldn’t be the other. This concept was particularly exciting because as a person with interests in both the sciences and the arts, I have always dreamt of pursuing both but have been typically discouraged from doing so. Yet here, from the mouth of a well-known scientist, I am told that they are one in the same. Incredible. The celebration went on as Dante shared stories and explained his scientific journey. Not only was the information he was sharing interesting to learn about, but he also added an element of humor that made the night much more enjoyable. It was easy to tell that he would be a fun professor to learn from. 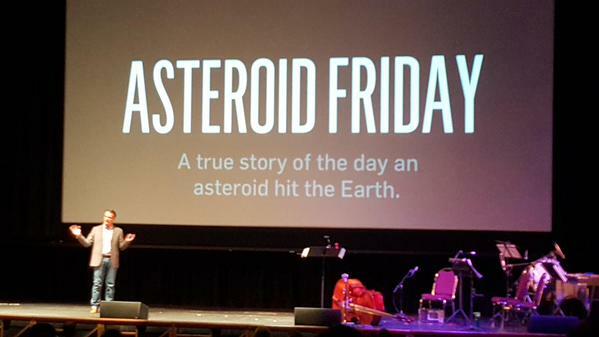 Dante Lauretta told the amazing story of “Asteroid Friday” – the day an asteroid hit the Earth. One of the most miraculous events of the night, in my opinion, was showing of a movie Dante had helped to create. It explained, in great detail, the creation of the asteroid Bennu. Not only was the animation amazing and incredibly insightful, but the music was so profound and exact that I was completely transfixed. This is when I finally started to believe that yes, art and science are meant to be. I was particularly interested when musician and composer Ian Zickler, explained his inspirations for the music set to the film. Not only were his methods cleverly creative, but also proved a sort of “scientific form” if you will. Bennuval! provided an in-depth of the art and science behind the “Bennu’s Journey” movie. As if the soundtrack by Zickler wasn’t enough, Bennuval! was also treated to music performances by ChamberLab. Again, I was able to see the scientific process behind the creation of this experimental music. I was thoroughly impressed not only by their technical skill, but also their willingness to reach farther from the “norm”, to experiment. ChamberLab provided experimental music throughout the evening. Bennuval! was definitely an “out there” show. There was nothing typical about it and as the night went on, the more extraordinary it got. The audience got to listen to different exciting stories from meteorite hunter, Geoff Notkin and also be taken away by the local improv acting group. I must say they are a talented group of people who can make any story or problem incredibly funny. They were a joy to watch. Geoff Notkin served as emcee and provided stories from his amazing career. The final piece to the Bennuval! puzzle was a circus act done by Flam Chen. Although it was obvious they were all technically skilled, their show lacked a sense of purpose to me. Don’t get me wrong, watching bizarre balancing acts on balls and stilts was very entertaining, but the idea behind their performance lost me a little bit. Maybe it just went over my head and I failed to make the big connection. But alas, it was very fun to watch. 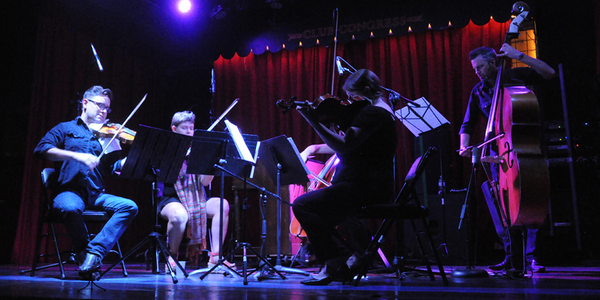 The Grand Finale included Flam Chen performing to the music of ChamberLab. Bennuval! was a whimsical whirlwind of science and art that absolutely captivated me and, I would imagine, the rest of the audience. Although the connections between the two subjects were clear, the event needed a bit of that fluidity. Other than the slight degree of capriciousness Bennuval! seemed to have (probably due to the fact that it’s the first of its kind), it really was an amazing show. It defied my expectations because honestly, I wasn’t really sure it would be able to pull off such a miraculous celebration and I was pleasantly surprised to find that it had been a complete success. I do sincerely hope that it becomes an annual event and continues to grow. 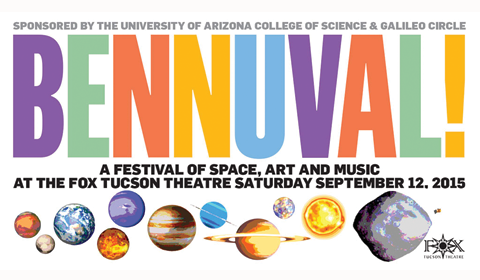 The Tucson community rose to the occasion to sponsor the Bennuval! Is the movie available anywhere online?